The 39 Steps is a 1935 British thriller film directed by Alfred Hitchcock and starring Robert Donat and Madeleine Carroll. 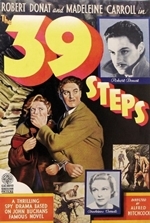 Loosely based on the 1915 adventure novel The Thirty-Nine Steps by John Buchan, the film is about a man in London who tries to help a counter-espionage agent prevent an organisation of spies called The 39 Steps from stealing top secret information. When the agent is killed and he stands accused of the murder, he goes on the run with an attractive woman to save himself and stop the spy ring. Of the four major film versions of the novel, Hitchcock's film has been the most acclaimed. In 1999, the British Film Institute ranked it the fourth best British film of the 20th century; in 2004, Total Film named it the 21st greatest British movie ever made, and in 2011 ranked it the second-best book-to-film adaptation of all time.